We know how frustrating it is when your computer slows down and simple tasks take forever. It is the perception of some users that their computer performance degrades after installing Norton. But the fact is that Norton is streamlined to provide a world-class protection without sacrificing performance. Independent tests now rank Norton as one of the lightest security products on the market. In fact, Norton recently received the highest performance score of all Internet security software companies in tests by PassMark® Software. 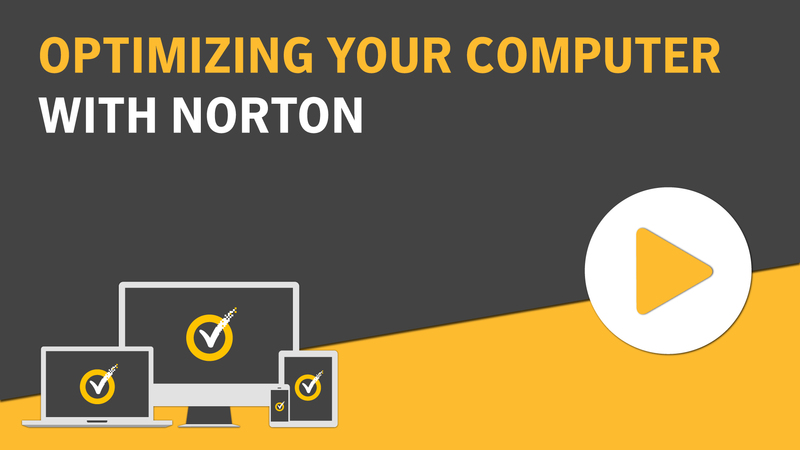 Norton can also boost your computer speed with performance management and optimization tools that make everyday tasks go more quickly. Many applications are configured to launch when you start your computer. These include programs that you never use, rarely use, or never knew that you had. The more programs that launch when you start your computer, the longer it takes. Norton Startup Manager lets you disable or delay startup programs to get you up and running faster. In the Norton main window, double-click Performance, and then click Startup Manager. In the On/Off column, uncheck programs that you don't use to prevent them from launching when your computer starts. In the Delay Start column, select programs that you want to load only after startup completes. The Optimize Disk tool rearranges file fragments, which get dispersed over your computer with time. It helps your computer load files or programs into memory faster so that you work more efficiently. In the Norton main window, double-click Performance, and then click Optimize Disk. When it completes, click Close. Every time you browse or download files, your computer stores temporary files. Even though you don't need to keep them, they collect over time and can slow you down. The File Cleanup tool removes the clutter to make your computer run faster. In the Norton main window, double-click Performance, and then click File Cleanup. Optimizing your computer's permanent disks can improve performance and reliability. Norton automatically checks your permanent disks for fragmentation and optimizes them if they are more than 10 percent fragmented. You can always check the latest reports to see if optimization is necessary. You can run Disk optimization only when disk has more than 15 percent of free space. During the disk optimization process, solid-state drives (SSD) are defragmented only in Windows 8 or later operating systems. When the activity is complete, click Close. Optimization of your boot volume maximizes the usable free space by rearranging file fragments into adjacent and contiguous clusters. When the drive head of your hard disk accesses all of the file data in one location, the file is read into the memory faster. In the Norton main window, double-click Performance, and then click Graphs. In the Graphs window, at the top of the security status graph, click Optimize. Ever played a game or watched a movie when your security software started running and your screen froze at the worst moment? You can set the Full Screen Detection tool to sense when you're running a program that shouldn't be interrupted. Norton then waits until you're done with the app before running background tasks that keep you protected. Under Silent Mode Settings, in the Full Screen Detection row, move the switch to On. If you think that Norton is slowing down your favorite programs, Quiet Mode settings stop Norton from running while you use them. Norton waits until you're done using these programs before starting background tasks that keep you protected. Under Silent Mode Settings, in the User-Specified Programs row, click Configure. In the Quiet Mode Programs window, click Add. In the Add Program dialog box, navigate to your program. Select the file, click Open, and then click OK.
Norton monitors your computer and can alert you if a program or process seems to use an unusual amount of resources. You can shut these programs down to improve performance if you're not using them. In the Graphs window, on the left pane, click Usage. To view the CPU graph, click the CPU tab. To view the memory graph, click the Memory tab. Click at any point on the graph to obtain a list of resource-consuming processes. Click the name of a process to obtain additional information about the process in the File Insight window. Do you need expert help improving computer performance or to fix any other everyday computer issues? Subscribe to Norton Ultimate Help Desk for comprehensive and affordable support anytime you need it.